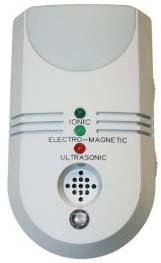 The HOME SENTINEL is the industry�s most advanced indoor pest repellent product. With years of designing and technical breakthroughs, this product is simple and safe to operate. This product does not use any poisons or chemicals to kill pests. It is safe for humans, pets and also pests. A high pressure ultrasonic sound that is only slightly audible to human ears. This pest repelling technique emits a disorienting pulse that startles and frightens away insects and rodents from your home or office. Your indoors are turned into a noisy place and the deterring noises ward off pests immediately. Ions are electrically charged atoms and are common place throughout our atmosphere. Animals are naturally sensitive to negative ions. The ionic control mimics the electrical charge of an incoming storm throughout your entire establishment. Pests become confused, frightened and seek shelter. Ions also pull bacteria and odors out of the air so pests cannot smell or detect food sources. Frequency signals traveling through your wires into your home can be detected by pests. The shifting frequency irritates rodent nervous systems while vibrations disturb insect receptors. Because the electromagnetic signals intermittently turn on and off every few seconds, pests are unable to build a tolerance and flee the area. This is a plug and go product. Simply position the product in an open AC outlet that is not hidden away for increase effectiveness.